J&S Machine carries a full line of 3C-C.L.O.M.E.A. bending machines capable of covering the many needs of the bending industry. The 3C-C.L.O.M.E.A. product line includes a variety of machines used to bend window and storefront extrusions, angle iron, tube and pipe, and a variety of other materials. To do this, 3C-C.L.O.M.E.A. has developed a complete line of hydraulic and electromechanical machines. With the application of several control options available, 3C-C.L.O.M.E.A. has a bending machine to fit your bending needs. The CRM Series of machines from 3C-C.L.O.M.E.A. are open-ended roll bending machines with three drive rollers. The central roller is hydraulically positioned to achieve a desired radius. The machine housing and frame are constructed of heavy G30 cast iron mounted on an electro welded sheet metal base, accurately machined, and painted with a high-grade industrial paint. All the shafts, gears, and pinions are constructed of nickel chromium steel that is heat-treated and ground, mounted in grease lubricated dynamic tapered bearings designed for heavy-duty loads. 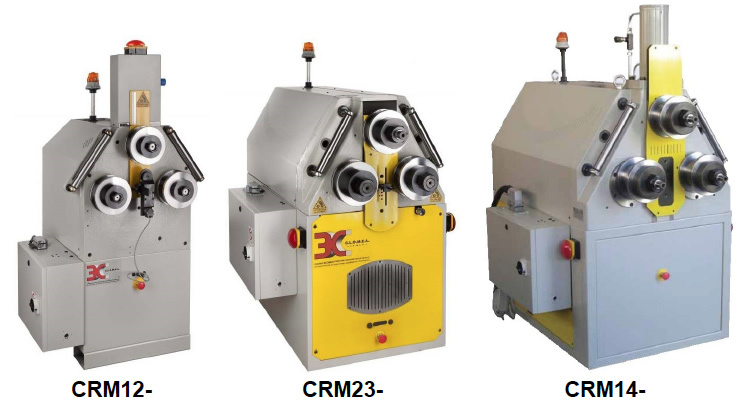 All models in the CRM Series is capable of operating on both a horizontal and vertical bending plane. 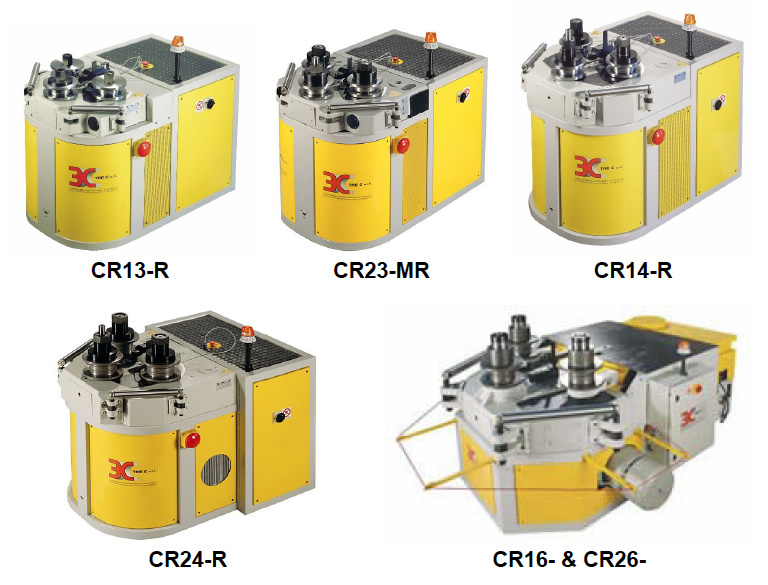 The CR Series of machines from 3C-C.L.O.M.E.A. 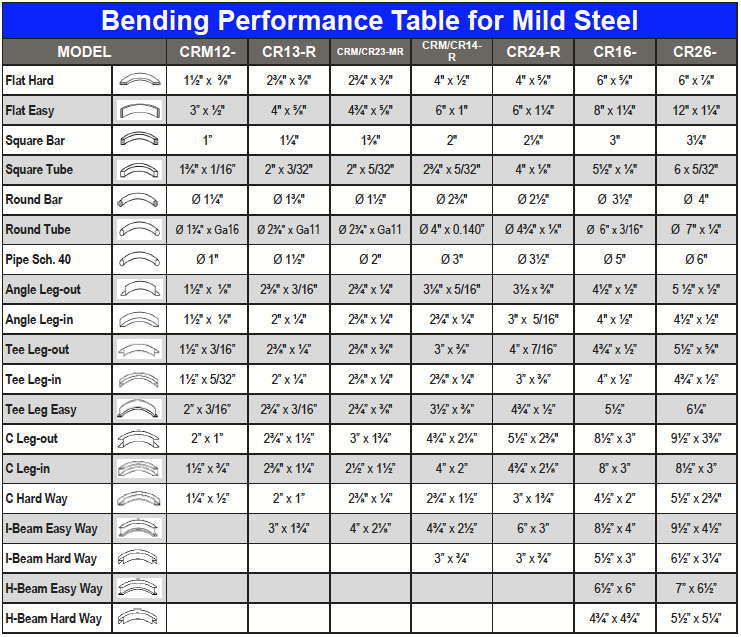 are high performance hydraulic machines for bending steel and aluminum sections. The outer rollers are hydraulically positioned to achieve the desired radius. The machine housing and frame are made of heavy G30 cast iron and are electro welded onto a sheet metal base. All of the shafts, gears, and pinions are constructed of nickel chromium steel that is heat-treated and ground, mounted in grease lubricated dynamic tapered bearings designed for heavy-duty loads. All three rollers of these machines are driven to give them ample power to pull material through the bend. The CR13-R to CR24-R models can be operated in both the horizontal and vertical position. Horizontal 30" x 36" x 63"
30" x 63" x 44" 38" x 47" x 48"
48" x 38" x 46" 41" x 57" x 65"
41" x 65" x 57" 48" x 38" x 46"
44" x 38" x 59" 48" x 38" x 46"
44" x 38" x 59"
Weight 775 lbs. 1170 lbs. 1765 lbs. 1170 lbs. 1170 lbs. Horizontal 50" x 38" x 48"
48" x 38" x 61" 50" x 44" x 50"
111" x 87" x 61"
Weight 2120 lbs. 2250 lbs. 7060 lbs. 7280 lbs.